At the Blue Deer Center in the Catskills of New York, April 25 through May 2, Eda Zavala Lopez will introduce people to "Healing with Amazon Medicinal Plants." In this healing workshop, Amazon Curandera, Eda Zavala Lopez brings with her medicinal plants from the Amazon jungle in Peru, plants with which she has developed a deep relationship. Our knowledge comes directly from nature, from the plants, from the universe, from earth's energy, from an inner connection with all of them. Eda Zavala Lopez will engage participants who come to the Blue Deer Center in rituals and ceremonies designed to initiate a deep personal purification process that will prepare people for guidance into an intimate connection with the spirits of these plants. 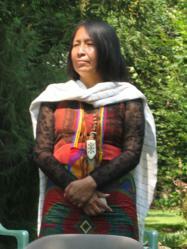 Eda Zavala Lopez comes from a long lineage of native women healers. A descendant of the Wari people she describes her knowledge of healing practices as being a part of her DNA. Her grandmother used plant medicines in a very natural way and Eda absorbed this directly and simply. She went on to study with native healers deep in the forest learning the intricacies of plant medicines and their properties from healers and the plants themselves. For more information about Eda Zavala Lopez you can visit her website at EdaZavalaLopez.com. Over a twenty year journey, Eda has supported and assisted Indigenous Communities’ efforts to protect the sacred rainforest, preserve traditional plants, perpetuate ancient healing plant practices, and empower themselves. To stimulate interest and support for her Peruvian indigenous brothers and sisters and the treasures of the rainforest, Eda now travels to the United States and other countries sharing her experiences and knowledge. She participates in conferences, forums, workshops, and conducts group healing ceremonies, as well as personal healing sessions. She has also been closely involved with Native American healers and Elders, and sacred ceremonies. In order to get the most benefit from what her plant medicine has to offer, attendees will eat a very simple diet and drink the herbal teas that Eda will provide for very deep cleansing and purification. This will be a time for retreat and inner reflection in a setting that supports this healing process. Participants of this workshop at the remote Blue Deer Center can register either for a 4 day or a 7 day retreat experience. More specific details about the workshop will be provided upon registration. Call Mark Gionfriddo, the Center Director, for more information about Eda Zavala Lopez or for registration. The Blue Deer Center is a healing and spiritual Retreat Center located in the Catskill Mountains. This land was recognized by indigenous peoples over a century ago as a place of healing. Come experience the natural world from a place of heart and connection.